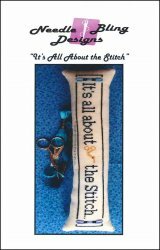 It's All About The Stitch [G1640] - $6.00 : Yarn Tree, Your wholesale source for cross stitch supplies. Cross stitch pattern by Needle Bling Designs. The verse "It's All About The Stitch" accented with skeins of thread and a pair of stork scissors. Stitch count 22h x 183w.